1 of 3 Heat oven to 400 degrees . Place a large piece of aluminum foil on a rimmed baking sheet. Trim beets and cut into 2-inch chunks. Place on foil and toss with 2 tbsp of the honey, 1 tbsp of the oil, 1/4 tsp of the salt and 1/8 tsp of pepper. Place thyme sprigs on top and seal foil around beets. Roast at 400 degrees for 45 minutes. 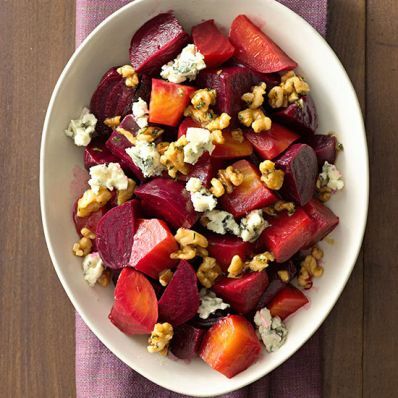 Allow beets to cool slightly before peeling (use gloves to keep hands from staining). Toss with juices from foil. 2 of 3 Make spiced nuts: In a small skillet, heat remaining 2 tbsp honey, 1 tbsp oil, 1/4 tsp salt and 1/8 tsp pepper, the chopped thyme, coriander, cumin, ginger and 1 tsp water over medium heat. Stir in walnuts until coated. Remove from heat. 3 of 3 Top beets with spiced nuts and cheese. Per Serving: 4 g pro., 3 g fiber, 18 g carb., 2 g sat. fat, 332 mg sodium, 6 mg chol., 12 g Fat, total, 184 kcal cal.